The Rory Gallagher Music Library provides music books, scores, CDs and DVDs, in all genres, classical, choral, traditional, jazz, contemporary, rock & pop for lending, reference and archival purposes. In 2004 the music library was dedicated to Rory Gallagher and renamed The Rory Gallagher Music Library. Rory Gallagher is widely recognised as one of Ireland’s greatest musicians. From his time with Taste, formed in Cork in the1960’s until his untimely death in June 1995, Rory, having started out as his brother Donal says a student of the blues became a master of the form. Rory’s own musical tastes knew no bounds, although his love of the blues was central to his life and art. Rory’s song writing has its roots not only in the blues, but also in the many crime novels which Rory, a voracious reader carried with him on tour. 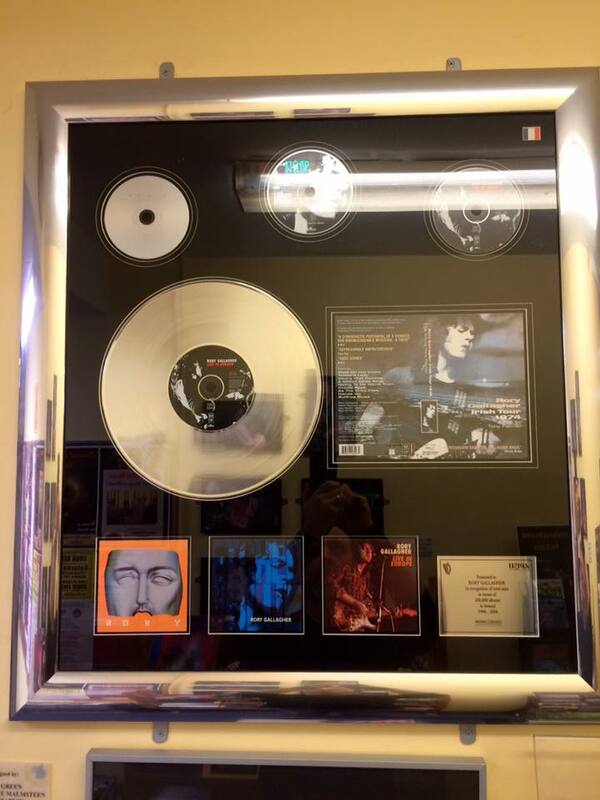 Rory Gallagher’s Platinum Disc for ‘Live in Europe’ proudly on display among other unique Rory related artefacts in the music library which bears his name. If you’re a member of Cork City Libraries, then you’re also a member of Naxos! Use your Cork City Libraries membership card to log in and discover a world of music! Simply follow the link and enter the barcode from your library card in the ‘Passcode’ field on the top-left of the page. Naxos Music Library is the most comprehensive collection of classical music available online offering over 1,754,000 tracks of Classical music, Jazz, World, Folk and Chinese music. It includes the complete BIS, Chandos, Hänssler, Hungaroton, Marco Polo, Naxos, Ondine and selected titles of other leading independent labels, with over 1,000 albums added monthly. Do you have a question? Contact us here! The Rory Gallagher Music Library site is an official online resource provided by Cork City Libraries and all content is uploaded, monitored and edited by staff of Cork City Libraries. Should you have any queries regarding this site or any of the information contained herein then please contact us directly. Is achmhainn oifigiúil idirlín de chuid Leabharlann na Cathrach Chorcaí é an suíomh seo. Tá sé fairithe agus chuirthe in eagair ag foireann na leabharlanna. Má tá ceist agat maidir leis an suíomh seo nó a chuid ábhair, té i dteangabháil go díreach linn le do thoil. Go raibh maith agat as ucht do chuairt! Mural on South Main Street, Cork.